July 6, 2010 /PN/ Swedish landscape photographer Hans Strand succeeded in capturing spectacular images of the active Icelandic volcano. In doing so, he demonstrated that the H4D-40 is a reliable outdoor camera that delivers superb results, even under the most adverse conditions and without a tripod. Renowned for his aerial photography, landscape photographer Hans Strand came within 600 meters of the Icelandic volcano Eyjafjallajökull in a Cessna 172, recording the eruption that kept European air traffic grounded for weeks at close range with his H4D-40. 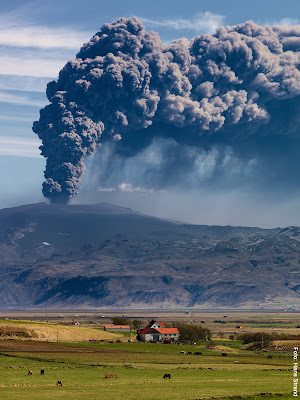 It took Hans Strand seven attempts to fly to Iceland due to the vast ash cloud of the Eyjafjallajökull volcano. Yet his persistence paid off, as he was one of the few photographers to capture images of the massive eruption. Hans Strand used the H4D-40 to capture razor-sharp images of the spectacular eruption of Iceland's Eyjafjallajökull volcano. Well aware of the extreme shooting conditions aboard the Cessna and the unique nature of his pictures, Strand took a camera that he could depend on completely: his H4D-40. Not only its reliability during the shoot, but also the quality of the results confirm that he made the right decision. His spectacular shots captured individual particles of ash within the dark cloud as well as the veil-like rain of dust - not to mention chunks of rock being ejected from the crater with tremendous force. 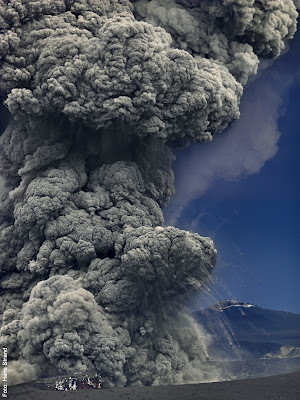 While Strand felt safe in the Cessna, he describes the spectacle as awe-inspiring: "The noise of the volcano was incredible. There were continuous explosions and huge bursts of lava shooting into the sky." Strand demonstrates that the H4D-40 is a reliable outdoor camera. In the face of such difficult conditions, the 54-year-old professional photographer also chose to rely on his Hasselblad for this shoot because he wanted to make extreme enlargements of his photos. The H4D-40's outstanding image quality and high resolution guarantee that even the most minute details appear razor-sharp and with excellent definition. Working in the confines of the Cessna, the medium-format camera proved as convenient as a 35mm DSLR: "I set the sensitivity to ISO 200 and the shutter speed to 1/800, and that was it - I was just pointing and shooting," he recalls. Strand goes without a tripod, using the H4D-40 for hand-held shots on the ground. Strand not only used the H4D-40 for hand-held shots while airborne. He also worked without a tripod on the ground, framing the ash cloud as a dramatic background to the tranquil Icelandic landscape: "The H4D-40 is naturally an outdoor camera, and it's just as well-suited for this job as a conventional DSLR. 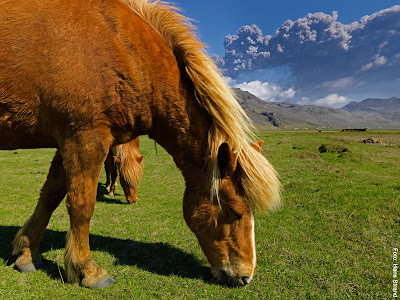 I also used it for hand-held shots of Icelandic ponies near the ash cloud." Strand relies on True Focus technology for absolute focusing accuracy. For his close-up pony portraits, Strand relied on his camera's True Focus technology, the most important advance of the H4D generation. Thanks to this innovation, he was able to correctly and accurately focus on a pony on the left-hand edge of the frame, despite the close range. "True Focus worked perfectly, just as I had expected," he notes. "The camera got pretty dirty while shooting the interior of the ash cloud from the ground," reports Strand, who had no problems keeping his gear operational under such extreme conditions in the field: "I cleaned it carefully every time I left the car." Back at his computer, Strand used the latest update of Phocus, Hasselblad's workflow software. "I processed the images in Phocus 2.5, and I think it's a fantastic application. The shots needed virtually no further editing after the initial processing." And while the colors of his images are extremely vivid, Strand did not doctor them after the fact. "To pre-empt discussions about falsified colors, I make it a point to only correct the color balance," he explains. "The intense blue of the ash cloud background is completely authentic. 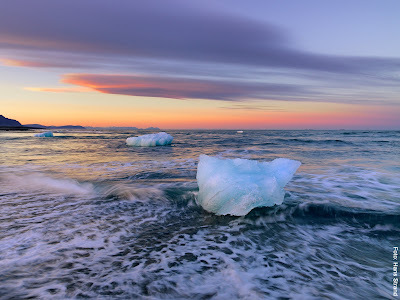 You really have to see the colors of Iceland to believe them." Bandar domino99 agen domino online Super website with a great sharing and amazing stories is ur web.. please keep doing what u do now.. thanks to you. 3 comments so far. What do you think?